When it comes to custom software development, business owners and executives usually have a lot of questions. That’s because they might be somewhat familiar with the topic, but they tend to not know much about the details. In other words, they want the savings of time and money that come with having a well-programmed custom software, but they aren’t always sure what to ask for. Or, they may not even know where to begin the process in the first place. Our team has taken on dozens of custom software development projects over the years, so today we thought we’d pitch in by answering a few of the most commonly asked questions that tend to come our way. #1 What’s The Difference Between A Website And Custom Software? #2 Why Would My Organization Want Or Need Custom Software? #3 How Can We Get Quality Custom Software Development? You can read more about custom software development here. Contact the WebRevelation design and development team today and we'll be happy to schedule a complimentary consultation for you. During that time, we'll find out about your project, let you know how we can help, and even give you some advice to use right away. Don’t let the opportunity to save time and money pass you by. Contact our team now to set up a time to talk! As 2018 comes to a close, the Team at WebRevelation wants to thank our clients and blog readers for another successful year! We are blessed to have new and existing customers who believe in the work we do. We’re excited about all that 2019 has in store for our company as we continue to grow our business. 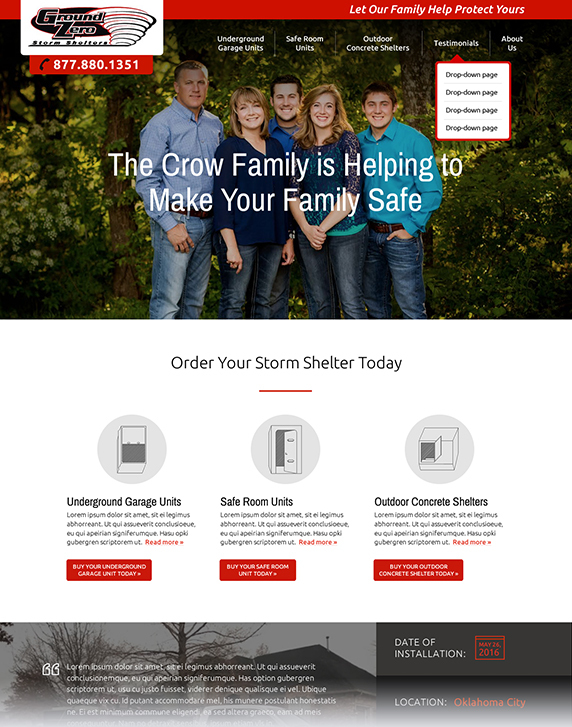 It’s clients of ours like Ground Zero Storm Shelters that we were able to help transform their e-commerce business through both a new website and custom web-based application development. Based in Oklahoma, Ground Zero is a multi-generation, family owned and operated business that focuses on providing personal security and natural disaster protection. They prebuild high-end shelters such as outdoor storm cellars, safe rooms, and underground garage storm shelters for customers throughout the country. Ground Zero previously faced numerous challenges with managing their complex pricing structure in the area of tracking and reporting. Like many other companies, they were using spreadsheets to conduct their business rather than relying on easy-to-use, intelligent custom web-based applications. Also, their previous website did not allow the ability for customers to make online deposits, yet those deposits were required for order placement. Overall, there were numerous areas of opportunity for greater efficiency both in technology and a variety of business practices. Ground Zero had actually been working with a different developer to make some much-needed changes to their website and ordering processes prior to engaging with WebRevelation. However, as the project evolved and became more complex, the developer couldn’t handle the demand and Ground Zero was left with unanswered questions and an entirely unfinished project. Unfortunately, we have heard of that type of situation happening all too often with other web companies. WebRevelation sprang into action and immediately began working on planning and executing the overhaul of Ground Zero’s website and ordering systems. Streamlining processes and improving efficiency were crucial aspects that WebRevelation made possible. Functionality was added to automatically perform down payment percentage calculations and complicated, zip code pricing. Ground Zero’s site was also integrated with QuickBooks to support more efficient business practices. Additional backend upgrades linked each customer’s notes with their account information for easy reference and implemented reminders to collect any additional information needed to proceed with production and installation. Automated systems were also added for workforce management of installation and warranty teams, allowing work assignments to be made based on availability and worker skill sets. Interested in learning more about other companies we have helped? Read more here. WebRevelation provides complimentary consultations. Whether it’s creating a new website, mobile app, or a web-based custom application, WebRevelation is here to help your business succeed. Contact us today by calling 817-283-3324 or online here. As we continue to look back on WebRevelation’s success with helping businesses succeed in the world of websites and applications in 2018, another company rises to the top of our mind. In 2016 we heard from our friends at Choice Partners, a purchasing cooperative, about the online challenges they were facing. In essence, they had a need to update their website and refine existing processes. Choice Partners serves both government entities and vendors. They provide RFP, procurement, and contract solutions that meet government purchasing requirements. 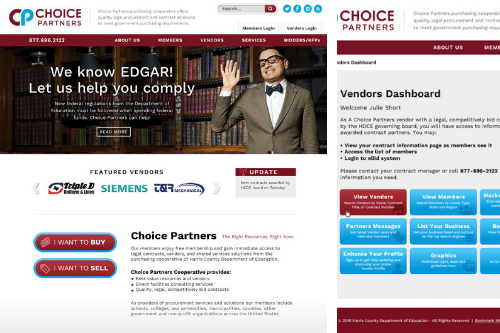 At the time, Choice Partners was limited with their website functionality in a variety of facets. To begin with, the login process was disorganized and complicated. Most attempted users had difficulty when it came time to submitting questions and receiving answers. By law, Choice Partners was required to make questions and answers public, yet it was not being done successfully. Vendors struggled to sell to government entities via the out-of-date online store. Even though Choice Partners faced numerous challenges, the agency had the foundation of a solid website and did not need to completely reinvent the wheel. 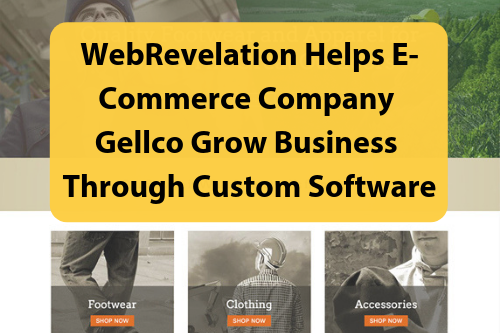 Instead, WebRevelation was able to build upon their current site with custom solutions and improvements. 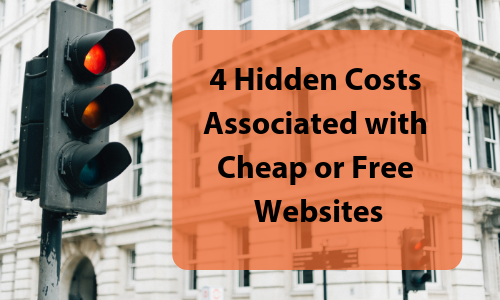 Integrating a new, custom system with the existing one is one way in which WebRevelation was able to save Choice Partners on expenses. A fresh website was designed, which now integrates seamlessly into the coop’s existing RFP system. On the front end, users now experience a unified system. The amount of user headaches decreased drastically thanks to gaining access through a single login to various resource areas. Coop members and vendors can now complete applications online in a simplified manner. Also, the updated portal allows government entities to easily shop approved vendors. That’s not all though. As far as the administrative functionality, Choice Partners has gained the ability to handle bidding questions through a built-in database and to manage, assign, and publish contracts online. Today, Choice Partners is attracting bids from a larger number of experienced vendors. WebRevelation is dedicated to building modern, user-friendly websites and intelligent application symptoms. We want to help your company thrive, just like we helped Choice Partners. We would enjoy the opportunity to discuss your business needs with you. Call us today at 817-283-3324 to set up a complimentary consultation or complete this form. 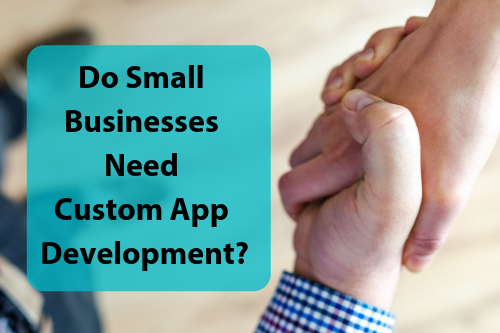 This is part 2 of the article, Do Small Businesses Need Custom App Development? You can read it here. Document storage isn’t the only major headache for those who work in very specialized industries. For instance, financial companies also have stringent reporting requirements and confidentiality guidelines they have to follow. When we work with these types of companies, we develop custom software that meets these challenges and presents them with all-in-one solutions. That way they can meet their needs for security and oversight, and do so without having to learn or maintain several different apps. Do you sell products or services online? If so then you already know how difficult it can be to find apps that tie together inventory, marketing, and fulfillment. Add in the tools you might need for your specific business (like a real-time currency converter or shipping tracker) and just managing your software can become overwhelming. We know that our e-commerce clients need to keep their focus on other areas, which is why we develop inclusive apps that combine all these different features into a single affordable solution. That lets a retailer keep growing without spending more than they should on software. Even in our digital age, managing employees is often the hardest part of running any business. However, that challenge can get a lot easier when you have the right tools for the job. With custom software that is designed specifically for your company, you can manage things like schedules, payrolls, and even training modules, or benefits. And, with web-enabled apps, you and your team can manage the details from anywhere. That’s a great way to save time and money while keeping your employees on track and working productively. There are literally hundreds of ways a small business might make good use of custom mobile apps. They can enhance communication, offer a dedicated customer interface, or even just plug into the kinds of software we have already outlined. Business owners are often surprised at how easy and affordable it is to develop a custom mobile app that works on a number of devices and platforms. You probably can’t spend your day fixed to one spot, so why should your software? It’s possible that you see one or more possibilities for your small business on the short list of uses for custom software development we have outlined here. Or, it might be that what you really need to help your business move forward is something altogether different. Either way, what’s important to know about our work is that it’s driven by your goals and challenges. Everything we do starts with the discovery process that focuses on what you’re facing and the specific outcomes you hope to achieve. To learn a bit more, and see what kinds of cost-effective solutions the WebRevelation software development team could come up with for you, contact us today to schedule a free initial consultation.